Autumn leaf color is a phenomenon that affects the normally green leaves of many deciduous trees and shrubs by which they take on, during a few weeks in the autumn season, various shades of red, yellow, purple, black, orange, pink, magenta, blue, and brown. The phenomenon is commonly called autumn colours or autumn foliage in British English and fall colors, fall foliage, or simply foliage in American English. In some areas of Canada and the United States, "leaf peeping" tourism is a major contribution to economic activity. This tourist activity occurs between the beginning of color changes and the onset of leaf fall, usually around September and October in the Northern Hemisphere and April to May in the Southern Hemisphere. A green leaf is green because of the presence of a pigment known as chlorophyll, which is inside an organelle called a chloroplast. When they are abundant in the leaf's cells, as they are during the growing season, the chlorophyll's green color dominates and masks out the colors of any other pigments that may be present in the leaf. Thus, the leaves of summer are characteristically green. Chlorophyll has a vital function: it captures solar rays and uses the resulting energy in the manufacture of the plant's food — simple sugars which are produced from water and carbon dioxide. These sugars are the basis of the plant's nourishment — the sole source of the carbohydrates needed for growth and development. In their food-manufacturing process, the chlorophylls breaks down, thus are being continually "used up". During the growing season, however, the plant replenishes the chlorophyll so that the supply remains high and the leaves stay green. In late summer, as daylight hours shorten and temperatures cool, the veins that carry fluids into and out of the leaf are gradually closed off as a layer of special cork cells forms at the base of each leaf. As this cork layer develops, water and mineral intake into the leaf is reduced, slowly at first, and then more rapidly. During this time, the chlorophyll begins to decrease. Often, the veins are still green after the tissues between them have almost completely changed color. 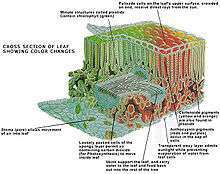 Much chlorophyll is in photosystem II (light-harvesting complex II or LHC II), the most abundant membrane protein on earth. LHC II captures light in photosynthesis. It is located in the thylakoid membrane of the chloroplast and it is composed of an apoprotein along with several ligands, the most important of which are chlorophylls a and b. In the fall, this complex is broken down. Chlorophyll degradation is thought to occur first. Recent research suggests that the beginning of chlorophyll degradation is catalyzed by chlorophyll b reductase, which reduces chlorophyll b to 7‑hydroxymethyl chlorophyll a, which is then reduced to chlorophyll a. This is believed to destabilize the complex, at which point breakdown of the apoprotein occurs. An important enzyme in the breakdown of the apoprotein is FtsH6, which belongs to the FtsH family of proteases. Chlorophylls degrade into colorless tetrapyrroles known as nonfluorescent chlorophyll catabolites. As the chlorophylls degrade, the hidden pigments of yellow xanthophylls and orange beta-carotene are revealed. These pigments are present throughout the year, but the red pigments, the anthocyanins, are synthesized de novo once roughly half of chlorophyll has been degraded. The amino acids released from degradation of light harvesting complexes are stored all winter in the tree's roots, branches, stems, and trunk until next spring, when they are recycled to releaf the tree. Carotenoids are present in leaves the whole year round, but their orange-yellow colors are usually masked by green chlorophyll. As autumn approaches, certain influences both inside and outside the plant cause the chlorophylls to be replaced at a slower rate than they are being used up. During this period, with the total supply of chlorophylls gradually dwindling, the "masking" effect slowly fades away. Then other pigments that have been present (along with the chlorophylls) in the cells all during the leaf's life begin to show through. These are carotenoids and they provide colorations of yellow, brown, orange, and the many hues in between. The carotenoids occur, along with the chlorophyll pigments, in tiny structures called plastids, within the cells of leaves. Sometimes, they are in such abundance in the leaf that they give a plant a yellow-green color, even during the summer. Usually, however, they become prominent for the first time in autumn, when the leaves begin to lose their chlorophyll. Carotenoids are common in many living things, giving characteristic color to carrots, corn, canaries, and daffodils, as well as egg yolks, rutabagas, buttercups, and bananas. Their brilliant yellows and oranges tint the leaves of such hardwood species as hickories, ash, maple, yellow poplar, aspen, birch, black cherry, sycamore, cottonwood, sassafras, and alder. Carotenoids are the dominant pigment in coloration of about 15-30% of tree species. During the summer growing season, phosphate is at a high level. It has a vital role in the breakdown of the sugars manufactured by chlorophyll, but in the fall, phosphate, along with the other chemicals and nutrients, moves out of the leaf into the stem of the plant. When this happens, the sugar-breakdown process changes, leading to the production of anthocyanin pigments. The brighter the light during this period, the greater the production of anthocyanins and the more brilliant the resulting color display. When the days of autumn are bright and cool, and the nights are chilly but not freezing, the brightest colorations usually develop. Anthocyanins temporarily color the edges of some of the very young leaves as they unfold from the buds in early spring. They also give the familiar color to such common fruits as cranberries, red apples, blueberries, cherries, strawberries, and plums. Anthocyanins are present in about 10% of tree species in temperate regions, although in certain areas — most famously New England — up to 70% of tree species may produce the pigment. In autumn forests, they appear vivid in the maples, oaks, sourwood, sweetgums, dogwoods, tupelos, cherry trees and persimmons. These same pigments often combine with the carotenoids' colors to create the deeper orange, fiery reds, and bronzes typical of many hardwood species. 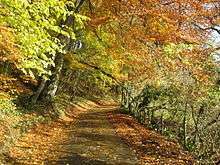 Deciduous plants were traditionally believed to shed their leaves in autumn primarily because the high costs involved in their maintenance would outweigh the benefits from photosynthesis during the winter period of low light availability and cold temperatures. In many cases, this turned out to be oversimplistic — other factors involved include insect predation, water loss, and damage from high winds or snowfall. Anthocyanins, responsible for red-purple coloration, are actively produced in autumn, but not involved in leaf-drop. A number of hypotheses on the role of pigment production in leaf-drop have been proposed, and generally fall into two categories: interaction with animals, and protection from nonbiological factors. Some trees, such as this American sweetgum at Keokea, Maui, develop bold fall colors in subtropical or tropical areas. 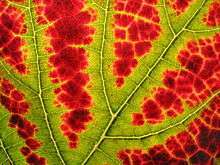 According to the photoprotection theory, anthocyanins protects the leaf against the harmful effects of light at low temperatures. Indeed, the leaves are about to fall, so protection is not of extreme importance for the tree. Photo-oxidation and photoinhibition, however, especially at low temperatures, make the process of reabsorbing nutrients less efficient. By shielding the leaf with anthocyanins, according to the photoprotection theory, the tree manages to reabsorb nutrients (especially nitrogen) more efficiently. According to the coevolution theory, the colors are warning signals towards insects that use the trees as a host for the winter, for example aphids. If the colors are linked to the amount of chemical defenses against insects, then the insects will avoid red leaves and increase their fitness; at the same time, trees with red leaves have an advantage because they reduce their parasite load. This has been shown in the case of apple trees where some domesticated apple varieties, unlike wild ones, lack red leaves in autumn. A greater proportion of aphids that avoid apple trees with red leaves manage to grow and develop compared to those that do not. A trade-off, moreover, exists between fruit size, leaf color, and aphids resistance as varieties with red leaves have smaller fruits, suggesting a cost to the production of red leaves linked to a greater need for reduced aphid infestation. Consistent with red-leaved trees providing reduced survival for aphids, tree species with bright leaves tend to select for more specialist aphid pests than do trees lacking bright leaves (autumn colors are useful only in those species coevolving with insect pests in autumn). The coevolution theory of autumn colors was proposed by W. D. Hamilton in 2001 as an example of evolutionary signalling theory. With biological signals such as red leaves, it is argued that because they are costly to produce, they are usually honest, so signal the true quality of the signaller with low-quality individuals being unable to fake them and cheat. Autumn colors would be a signal if they are costly to produce, or be impossible to fake (for example if autumn pigments were produced by the same biochemical pathway that produces the chemical defenses against the insects). The change of leaf colors prior to fall have also been suggested as adaptations that may help to undermine the camouflage of herbivores. Many plants with berries attract birds with especially visible berry and/or leaf color, particularly bright red. The birds get a meal, while the shrub, vine, or typically small tree gets undigested seeds carried off and deposited with the birds' manure. Poison ivy is particularly notable for having bright-red foliage drawing birds to its off-white seeds (which are edible for birds, but not most mammals). The brilliant red color of maple leaves is created by processes separate from those in chlorophyll breakdown. 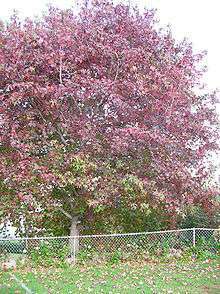 When the tree is struggling to cope with the energy demands of a changing and challenging season, maple trees are involved in an additional metabolic expenditure to create anthocyanins. These anthocyanins, which create the visual red hues, have been found to aid in interspecific competition by stunting the growth of nearby saplings (allelopathy). 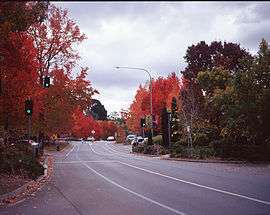 The town of Stirling, South Australia, located in the Adelaide Hills, attracts many tourists during autumn. Although some autumn coloration occurs wherever deciduous trees are found, the most brightly colored autumn foliage is found in four or five regions of the world: most of southern mainland Canada; most of the eastern part of the United States, as well as smaller areas of forest further west; Scandinavia, Northern, and Western Europe north of the Alps; the Caucasus region near the Black Sea, Russia; and Eastern Asia, including much of northern and eastern China, as well as Argentina, Chile, southern Brazil, Korea, Japan and New Zealand's South Island. Compared to Western Europe, North America provides many more arbor species (more than 800 species and about 70 oaks, compared to 51 and three, respectively, in Western Europe) which adds many more different colors to the spectacle. The main reason was the different effect of the ice ages—while in North America, species were protected in more southern regions along north–south ranging mountains, which was not the case in Europe. 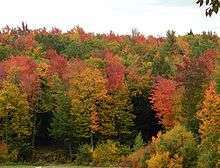 Global warming and rising carbon dioxide levels in the atmosphere delay the usual autumn spectacle of changing colors and falling leaves in northern hardwood forests, and increase forest productivity. Experiments with poplar trees showed that they stayed greener longer with higher CO2 levels, independent of temperature changes. However, the experiments over two years were too brief to indicate how mature forests may be affected over time. Also, other factors, such as increasing ozone levels close to the ground (tropospheric ozone pollution), can negate the beneficial effects of elevated carbon dioxide. This article incorporates public domain material from the United States Government document "the USDA Forest Service". 1 2 3 4 5 6 7 8 Archetti, Marco; Döring, Thomas F.; Hagen, Snorre B.; Hughes, Nicole M.; Leather, Simon R.; Lee, David W.; Lev-Yadun, Simcha; Manetas, Yiannis; Ougham, Helen J. (2011). "Unravelling the evolution of autumn colours: an interdisciplinary approach". Trends in Ecology & Evolution. 24 (3): 166–73. doi:10.1016/j.tree.2008.10.006. PMID 19178979. ↑ Horie, Y.; Ito, H.; Kusaba, M.; Tanaka, R.; Tanaka, A. (2009). "Participation of Chlorophyll b Reductase in the Initial Step of the Degradation of Light-harvesting Chlorophyll a/b-Protein Complexes in Arabidopsis". Journal of Biological Chemistry. 284 (26): 17449–56. doi:10.1074/jbc.M109.008912. PMC 2719385 . PMID 19403948. ↑ Zelisko, A.; Garcia-Lorenzo, M.; Jackowski, G.; Jansson, S.; Funk, C. (2005). "AtFtsH6 is involved in the degradation of the light-harvesting complex II during high-light acclimation and senescence". Proceedings of the National Academy of Sciences. 102 (38): 13699–704. Bibcode:2005PNAS..10213699Z. doi:10.1073/pnas.0503472102. ↑ Thomas, H; Stoddart, J L (1980). "Leaf Senescence". Annual Review of Plant Physiology. 31: 83–111. doi:10.1146/annurev.pp.31.060180.000503. ↑ Labandeira, C. C.; Dilcher, DL; Davis, DR; Wagner, DL (1994). "Ninety-seven million years of angiosperm-insect association: paleobiological insights into the meaning of coevolution". Proceedings of the National Academy of Sciences. 91 (25): 12278–82. Bibcode:1994PNAS...9112278L. doi:10.1073/pnas.91.25.12278. PMC 45420 . PMID 11607501. ↑ Lee, David; Gould, Kevin (2002). "Why Leaves Turn Red". American Scientist. 90 (6): 524–531. Bibcode:2002AmSci..90..524L. doi:10.1511/2002.6.524. ↑ Lee, D; Gould, K (2002). "Anthocyanins in leaves and other vegetative organs: An introduction". Advances in Botanical Research. 37: 1–16. doi:10.1016/S0065-2296(02)37040-X. ISBN 978-0-12-005937-9. ↑ Archetti, M; Brown, S. P. (June 2004). "The coevolution theory of autumn colours". Proc. Biol. Sci. 271 (1545): 1219–23. doi:10.1098/rspb.2004.2728. PMC 1691721 . PMID 15306345. 1 2 Archetti, M. (2009). "Evidence from the domestication of apple for the maintenance of autumn colours by coevolution". Proceedings of the Royal Society B: Biological Sciences. 276 (1667): 2575–80. doi:10.1098/rspb.2009.0355. PMC 2684696 . PMID 19369261. 1 2 Hamilton, W. D.; Brown, S. P. (2001). "Autumn tree colours as a handicap signal". Proceedings of the Royal Society B: Biological Sciences. 268 (1475): 1489–93. doi:10.1098/rspb.2001.1672. PMC 1088768 . PMID 11454293. ↑ Lev-Yadun, Simcha; Dafni, Amots; Flaishman, Moshe A.; Inbar, Moshe; Izhaki, Ido; Katzir, Gadi; Ne'eman, Gidi (2004). "Plant coloration undermines herbivorous insect camouflage". BioEssays. 26 (10): 1126–30. doi:10.1002/bies.20112. PMID 15382135. ↑ "Pest Alert". South Dakota State University. August 30, 1998. Archived from the original on 20 October 2006. Retrieved 2006-11-28. ↑ Altman, Daniel (November 8, 2006). "Fall foliage sets Japan ablaze". Taipei Times. Retrieved 2006-11-28. 1 2 Taylor, Gail; Tallis, Matthew J.; Giardina, Christian P.; Percy, Kevin E.; Miglietta, Franco; Gupta, Pooja S.; Gioli, Beniamino; Calfapietra, Carlo; Gielen, Birgit (2007). "Future atmospheric CO2 leads to delayed autumnal senescence". Global Change Biology. 14 (2): 264–75. doi:10.1111/j.1365-2486.2007.01473.x. ↑ "Forests Could Benefit When Fall Color Comes Late". Newswise. Retrieved 2008-08-17. Guy, Robert D.; Krakowski, Jodie (2003). "Autumn Colours – Nature's Canvas is a Silk Parasol" (PDF). Davidsonia. 14 (4): 111–20. Archived from the original (PDF) on 19 October 2013. Retrieved 2007-05-18. Wikimedia Commons has media related to Leaves in autumn. Wikimedia Commons has media related to Autumn. Sanderson, Katharine (2007). "Why autumn leaves turn red". Nature. doi:10.1038/news.2007.202.